Pocket General is a 6mm wargaming system which provides the models, terrain and other necessities to allow you to play your favourite tabletop wargames anywhere. Pocket General allows you to mitigate both these problematic elements. 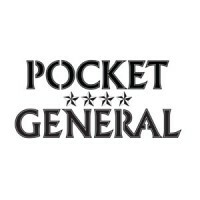 Due to its small size, Pocket General is perfect for those who have to travel to play, those who cannot find the space to play in their homes or those who have limited time for games including the often lengthy set-up and tidy-up that standard wargames entail.